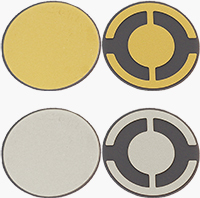 Popular 14.0mm (0.55”) in diameter and compatible with thickness measurement, controller and QCM systems using a 6MHz sensor. These quartz crystals are used on sputter coaters, carbon coaters and vacuum deposition systems from: Cressington, Agar, Bal-Tec, Denton, Emitec, Edwards, JEOL, Leica, Polaron, Quorum and Safe-matic. The EM-Tec quartz crystals are packaged in a flat pack carousel which contains 10 each QCM crystals. Silver electrode is recommended for high film stress deposition materials such as Chromium, Nickel, Platinum, Iridium, Carbon.